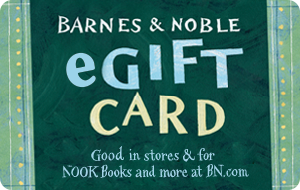 Barnes & Noble eGift Cards can be used at any Barnes & Noble store nationwide and at BN.com (www.bn.com). They can also be used at any Barnes & Noble College location. Maintenance, dormancy or service fees do not apply to balances on eGift Cards. Barnes & Noble eGift Cards have no expiration dates. They may be used to purchase annual memberships in the Barnes & Noble Membership program (continuous billing memberships require a valid credit card). Barnes & Noble eGift Cards will not be replaced if lost or stolen. Barnes & Noble eGift Cards will not be exchangeable for cash except where required by law. Barnes & Noble eGift Cards are issued by Barnes & Noble Marketing Services LLC. Other conditions may apply.